Young Audiences can help you earn up to 70 points towards your school’s Sustainable Jersey Certification! Registered and certified schools gain priority access to grant programs and are eligible to apply for the Sustainable Jersey for Schools Small Grants program. YA Assembly Artist group JUMP WITH JILL transforming nutrition education into a rock concert! 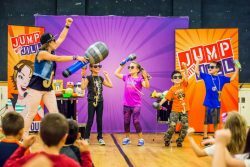 Jump with Jill and Healthily Ever After educate students about healthy eating. THE JUNK JAM BAND is a high energy, interactive, and educational group. Using found objects and homemade instruments they deliver messages of environmental awareness, social responsibility, and recycling. Our teaching artists can deliver workshops and residencies that support learning about topics related to sustainability. 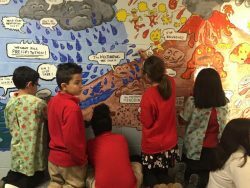 Students at work with YA teaching artist Kevin Pyle on a comic-inspired mural illustrating the water and rock cycles. Our residency programs can address your sustainability needs and provide on going benefit to your school. Got idea, we’ll work with you to design and implement a program that aligns with your sustainability goals. 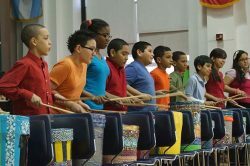 Students create music with drums they made and personalized in a YA drumming residency with Teaching Artist Josh Robinson. 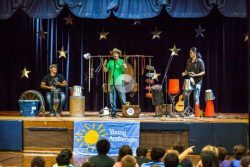 Schedule any Young Audiences program! Book Arts with YA Teaching Artist Gabrielle Kanter! 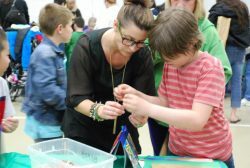 A student and teacher work together to create a cereal box book at a Creatively Green Family Arts Festival. We are your partner in arts education. Talk to us about creating a plan together! Young Audiences can be a part of your sustainability focused fair for students and families. or ask our staff to talk with you about how Young Audiences can help you become a certified Sustainable Jersey School.